They all had that glow! We’re talking here about the people who have adopted and are sharing their lives with retired racing greyhounds. As for the dogs, all looked content, placid, snug in their coats on this cold Sunday morning, quietly standing close to their families. 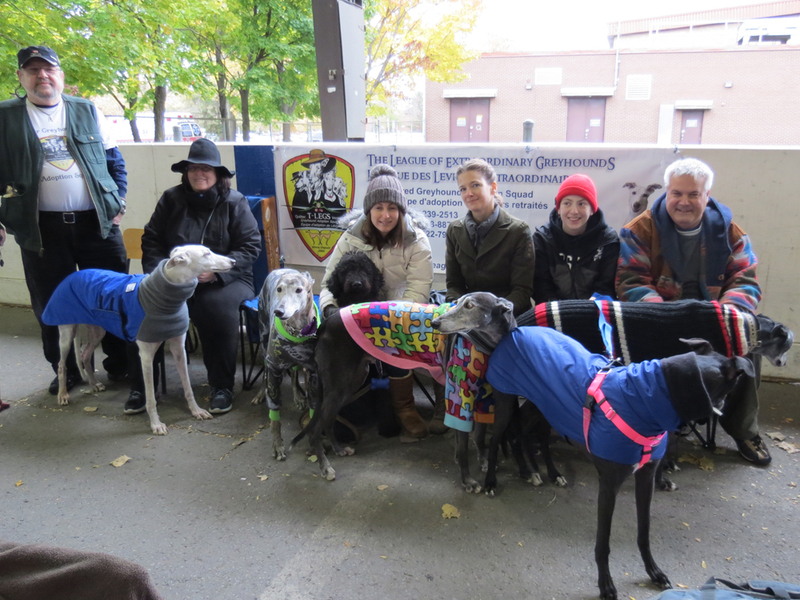 Not one barked the entire time we were there, unlike the other dogs at the event. We met half a dozen or so at a gathering last month in a Côte Saint Luc arena, at a fund-raising get-together to support autism. 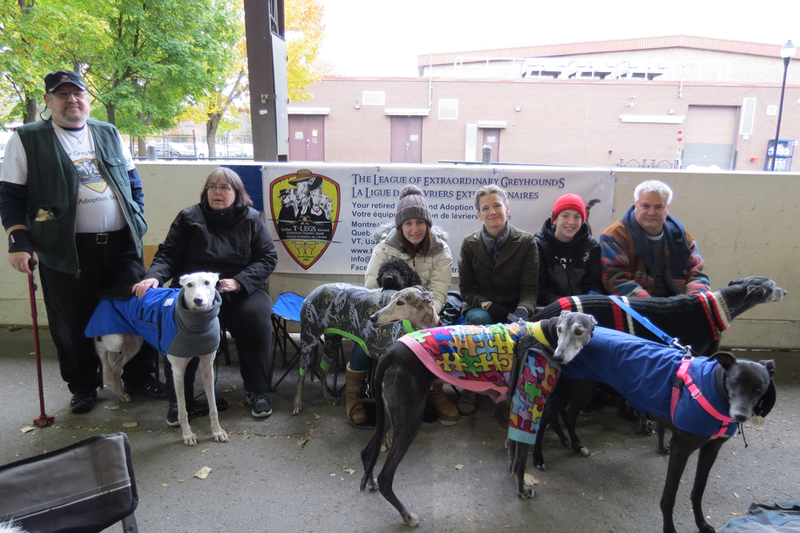 It was a perfect occasion to get to know the people who have adopted greyhounds that had retired from the racing life or were let go because they never fulfilled the expectations for racing dogs. While they are used on the race course, the dogs are well cared for and not mistreated in any way, it was explained to me. But when they get too old to perform or do not respond to expected behavior as racing animals, they are “retired” and made available for adoption. Donna Deskin of Côte Saint-Luc adopted Ricky about three years ago, when he was two. It was her tenth adoption of a greyhound. How did it she get involved? She explained what draws people to these racing veterans. 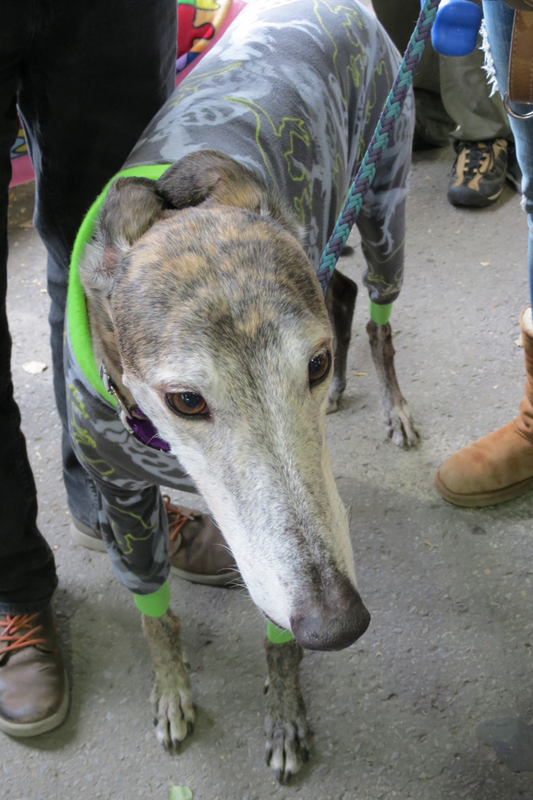 Deskin has a second greyhound at home, an 11-year-old who was too frail to come to the arena event on this cold Sunday. She said she walks them twice a day and takes them outside for a pee-break at day’s end. When she lets them off the leash in a fenced-in dog park, the dogs will sprint at 72 kilometers an hour. That usually does not last for long. Ricky was a bit young to “retire” but on the track did not seem that interested in the protocol, which is chasing the “bunny” that was hanging in front of him. “He would rather have a chat with the dog racing next to him,” Deskin explained, and so after three such incidents, he was deemed unsuitable as a racing hound. In contrast, one of her previous greyhounds was retired after an active career of more than 200 races. Pierre Tousignant has had 12-year-old Zorro, for almost a year. He has been fostering greyhounds for about 15 years, and says this is about his 35th. He boarded the dogs until a suitable home could be found. Prospective adoptees fill out an application form and contact the all-volunteer support network here for an interview and home visit. If approved, they accompany the applicant to the kennel in Vermont where dogs are presented that are a good match for the prospective adopter. Adoption costs, according to those who completed the process recently, is $450 US. Before placement, all dogs get a veterinary exam, are spayed or neutered, heartworm test, rabies vaccination, distemper/parvo vaccination, routine worming and flea dip, grooming, nail clipping, and ear cleaning. Adoptees get a health certificate, ID tag, and a new collar with a leash. A muzzle is provided for safety as they learn to live in a home. 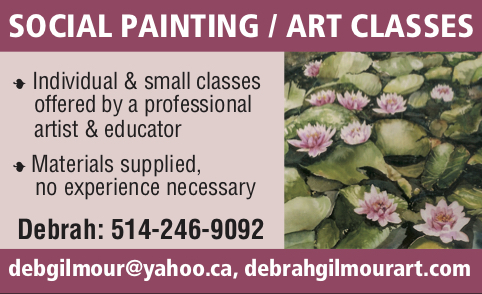 Registration papers are included when available. “She’s known as the greyhound of the neighbourhood. Everybody knows her. 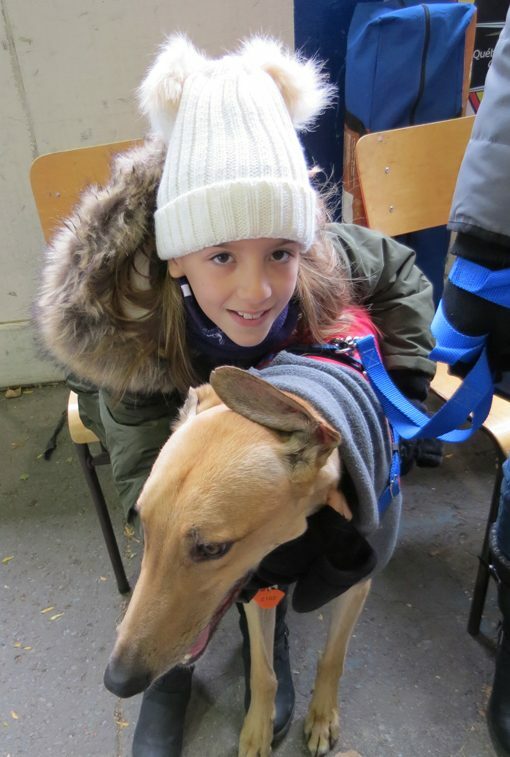 She has a lot of dog friends, human friends, a lot of people love her.” Hélène Morency, who works in a veterinary clinic, adopted her greyhound three years ago and named her dog after the Egyptian god Anubis. “They are rare, majestic looking, elegant. I went to get a greyhound with my daughter, Marie-Ange, and the dog was the one who chose her!” Legault enthused. For information on the adoption process, contact The League of Extraordinary Greyhounds, or email info@t-legs.com or click on northerngreyhoundadoptions.org. 4 Comments on "Greyhounds are couch potatoes, love to chill with their humans"
Beautiful dogs but no mention of the cruel downside of this industry. It should have been banned years ago. Fortunately, because of strong protest, some tracks are having to close. It is simply not true that dogs are well cared for while racing and the training process is brutal – often with live lures. Adoptions are a very small drop in the bucket. The vast majority of animals are killed when worn out or not up to scratch. The truth must be told! Thank you for highlighting the adoption of these dogs. I do want to mention though, that contrary to the statement in the article, racing dogs do suffer mistreatment and thousands are injured annually. There are numerous issues associated with the industry: long periods of confinement; extreme temperatures; and the use of live baits such as rabbits and opossums which are torn apart by the dogs, to name a few. 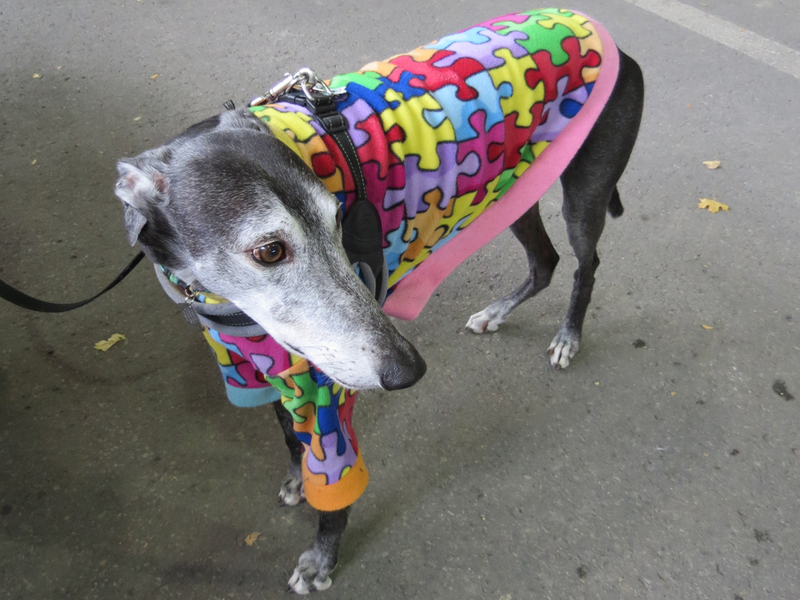 Fortunately, there is an organization dedicated to ending dog racing and helping individual dogs called Grey2KUSA. Anyone who is capable of reading and absorbing the written word knows about the inherent cruelty of dog racing; it is ridiculous to assume the public is so badly informed and naïve as to believe this nonsense that “dogs like it”… do they want me to believe that the live rabbits used as bait “also like it”.